Construction is set to begin this summer on a 52.8-mile stretch of road that will extend the Grand Parkway from Hwy. 59 in New Caney to Hwy. 146 in Baytown, which will improve mobility in the area, according to officials. The project is broken down into segments, with construction beginning on segments H and I-2B first. Work will begin on the remaining segments-I-1 and I-2A-in January 2019. 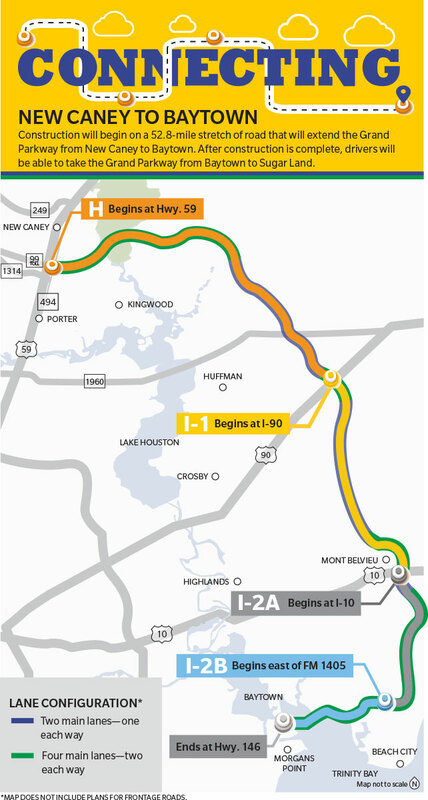 According to a Texas Department of Transportation press release, the work on segment I-2A-which is already operational and runs from I-10 to FM 1405 near Baytown- includes upgrading tolling equipment. The entire project is scheduled to be completed and open to drivers in spring 2022, said Janice Hayes, Grand Parkway Infrastructure public relations manager. In March 2017, TxDOT awarded GPI-which is a joint venture between Ferrovial Agroman, Webber LLC and Granite Construction Inc. construction firms-with a $894 million contract to design and build the corridor. Hayes said the entire project-including land acquisition-will cost TxDOT an estimated $1.28 billion. Hayes said she believes the project will improve safety and mobility in areas like New Caney, where the population has increased over the past decade. The number of residents living in ZIP code 77357-which consists of New Caney-increased from 17,823 to 23,491, or 31.8 percent, between 2011 and 2016, according to U.S. census data. "The improvements produce benefits locally and regionally by improving connectivity within the existing transportation network by providing a circumferential link between Hwy. 59 and Hwy. 146," Hayes said. GPI plans to begin construction at each end of the roadway first because those areas are more accessible than the middle of the corridor that runs through rural areas without much infrastructure. Hayes said TxDOT is still finalizing toll rates for the roadway. When developing the scope of the project, TxDOT determined different parts of the roadway will have different lane configurations. In more populated areas, such as New Caney and Baytown, the roadway will be at its widest and consist of four main lanes and four frontage roads. In less populated areas, such as most of Liberty County, the roadway will consist of two main lanes and no frontage roads. TxDOT has to acquire more than 200 parcels of land before completing the project. Hayes said the state agency will continue to purchase land while construction takes place in areas where land has already been acquired. After the roadway opens in 2022, drivers will be able to take the Grand Parkway continuously from Hwy. 146 in Baytown around Houston to Hwy. 59 south in Fort Bend County. After it opens, there will be three proposed segments of the Grand Parkway remaining-which will run through Fort Bend, Brazoria and Galveston counties. Once completed, the Grand Parkway will form a 180-mile loop that runs through seven counties.